From its origins as a prestigious artist cooperative in Manhattan, celebrating its 50th Anniversary in 2008, the NYC Phoenix Art has evolved into a community oriented center for all the arts. Founded in 1958 during the "Tenth Street" days, early gallery members included Elaine de Kooning, John Fischer, Red Grooms, Lenore Jaffee, Ted Jones, Alice Neel, Jay Milder and Cecily Barth Firestein who has been a member of the gallery since 1959. 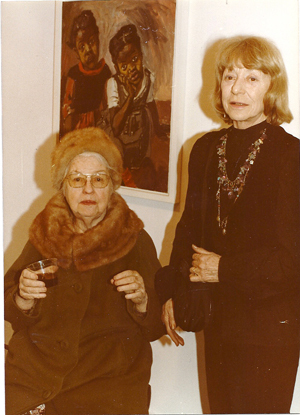 Alice Neel (left) and Elaine de Kooning were featured artists at the gallery's 25th Anniversary, December, 1983. Their joint exhibition was held in March, 1984. Just a word about some others who were there: our friend and collector Bill Littlefield, gesturing with his cigarette holder, tall, dignified and urbane in his Harvard 1913 football sweater; the sardonic David Rosenberg, brother of Harold and director of the Camino; Alex Katz, soon to be famous. The shy, simple Isser Aronovici, founder of the Phoenix Gallery and creator of magnificent, sharply satirical Biblical figures in black, brown and grey was followed by Alice Neel, his secular counterpart, blonde, buxom, and draped in a sleazy shawl. The artist collective has artist members dedicated to the highest level of professionalism. Each brings his or her own unique style and vision to the diverse group that makes up the NYC Phoenix Art. These artists, all carefully chosen for membership by NYC Phoenix Art artist peers, work in all media and create art that encompasses and reflects wide cultural and ethnic interests. The collective provides artist members an on line space to exhibit and as well as twice a year pop up exhibits in NYC. The collective reaches out to members of the community by scheduling on line exhibits of emerging and established artists. The artist collective conducts and publishes select artist interviews on the NYC Phoenix Arts website. In continuous operation since 1958, the NYC Phoenix Art represents a committed artist community that runs a non-profit public on line exhibition space for fellow professional and emerging artists. In addition, it has pop up exhibitions twice a year.